When the Giants were down by 12 with just under five minutes to go in the game, I gave up on this team. Dez Bryant had just walked into the end zone and all but ended Big Blue’s season. I believed this era of Giants football was over – let Coughlin retire, replace half the roster, get rid of Fewell, etc. Who knew that the Giants were about to pull off the most incredible comeback of the season? In a season full of Eli Manning comebacks in the fourth quarter, this was by far the most epic. Every time Eli pulls off these heroic efforts late in the game, I always bring back his “elite” status. But after last night, who doesn’t believe this guy is one of the best? He has single-handedly kept the 2011 Giants season afloat. 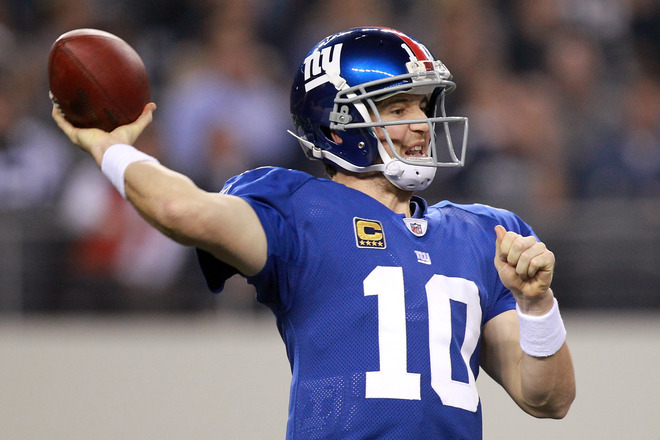 With last night’s performance, Eli has surpassed 4,000 passing yards for the third straight season. He has led six fourth quarter comebacks this year – the two best being in Foxboro and in Dallas. Obviously there are much better candidates for MVP this season (Rodgers, Brady, Brees), but Manning should definitely be considered a candidate. 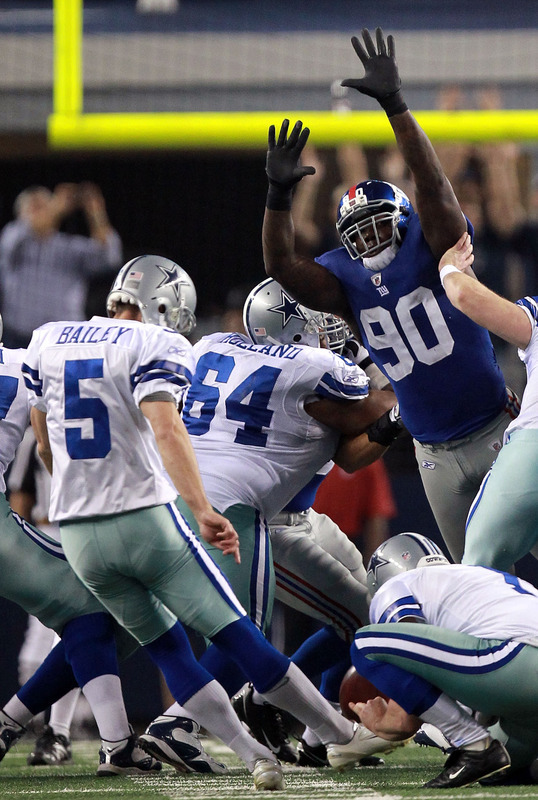 Now let’s shift our focus to last night’s player of the game – Jason Pierre-Paul. In a game where the secondary was better off on the sidelines, Paul single-handedly shut down the Cowboys in the fourth quarter. Of course, everyone will look at the blocked field goal as the play of the game. But what didn’t JPP do last night? Let’s see: a safety, a forced fumble, two sacks, and a key open-field tackle late in the game that saved the Giants’ season. Out of the Cowboys’ first eight drives, they didn’t score on two of them . Those two drives ended in a Pierre-Paul safety and a sack. I haven’t seen this kind of defensive performance since LT. This week we can finally celebrate a Giants victory, the first since the epic battle in Foxboro. But this team still has a long way to go. The Giants can’t sleep on the Redskins. Even though the Skins’ record isn’t impressive, they played the Patriots very well yesterday. Plus, they defeated the GMen in the first week of the season. Game time is next Sunday at 1pm. This entry was posted on December 12, 2011 at 12:28 pm and is filed under Giants. You can follow any responses to this entry through the RSS 2.0 feed. You can leave a response, or trackback from your own site. almost turned it off with 5 minutes to go……but said to myself..”just one more drive”…..and before you knew it…. Big Blue Nirvana!!! absolutely rob! same here. was getting ready for basketball season until Eli did it again! Big Blue ain’t done yet! I figured we’cdcome back – just didn’t want to do it too fast and give our Defense time to screw it up.